Abu Dhabi: The recent changes to health insurance policies in the emirate of Abu Dhabi has many low-income-earning workers concerned, and they say that the additional charges will be a difficult burden to bear. Many do not yet understand the full impact of the changes, but are wary of the added cost that could now be imposed upon them by sponsors or companies. The Health Authority Abu Dhabi (Haad), the emirate’s health care regulator, announced on June 30 that workers aged 40 years and older who are covered under the Abu Dhabi Basic Plan could now have to pay up to 50 per cent of their insurance premiums. These premiums, which are provided by The National Health Insurance Company (Daman), were earlier set at Dh600 per adult sponsored by groups, small investors, Emirati individuals and expatriate individuals. The plans provide an annual insurance cover of Dh250,000 for outpatient and inpatient treatment. Changes posted on the Daman website however show that the premium now has increased to Dh800 for all sponsors, except for those sponsored by Emirati individuals. According to the law, sponsors could now also ask employees who are 40 years or older to pay up to Dh400 each year for their insurance cover, unless they are domestic workers in Emirati households. “This will be a great burden upon me, and I do not know how I will handle the cost,” A.B., a 50-year-old watchman in the capital, told Gulf News. “I earn just Dh800 each month. This amount is not enough to sustain my family of five young children, wife and ageing father back home, so I have to do odd jobs to earn another Dh800. I send nearly 80 per cent of the Dh1,600 to my family, and keep just a little for my food and daily expenses,” he explained. A.B., who is diabetic, said he also has to pay Dh30 under his insurance plan every time he sees a doctor. “I try to stay as healthy as possible so that I don’t have to see a doctor. This is why the added cost will be difficult for people like me,” he added. Most small investors and groups pay the insurance premium at the time of renewing expatriate visas, so workers with renewals that are looming appeared especially worried. I.V., a 48-year-old supervisor at a small store, was also dismayed to hear of the new changes. “Of the 1,800 I am paid each month, I send Dh1,600 to my family. This money is used for the education of my two children, the family’s daily expenses and my parents’ medication. So having to pay Dh400 more for my health insurance every year will not be easy,” he said. I.V.’s visa is due to be renewed next month. Fahad, a grocery store owner from India, added that many workers do not even make regular use of health facilities. “Two of my employees are older than 40 years, and they earn Dh3,000 a month. They then send back Dh2,500 to their families. To my knowledge, they rarely ever go to the hospital for treatment, so this will be difficult on them,” he said. Saju, an Indian security guard, said he gets all his cholesterol-lowering drugs from India. “But I believe my sponsor will not impose the extra cost upon me if he has a choice not to,” he added. 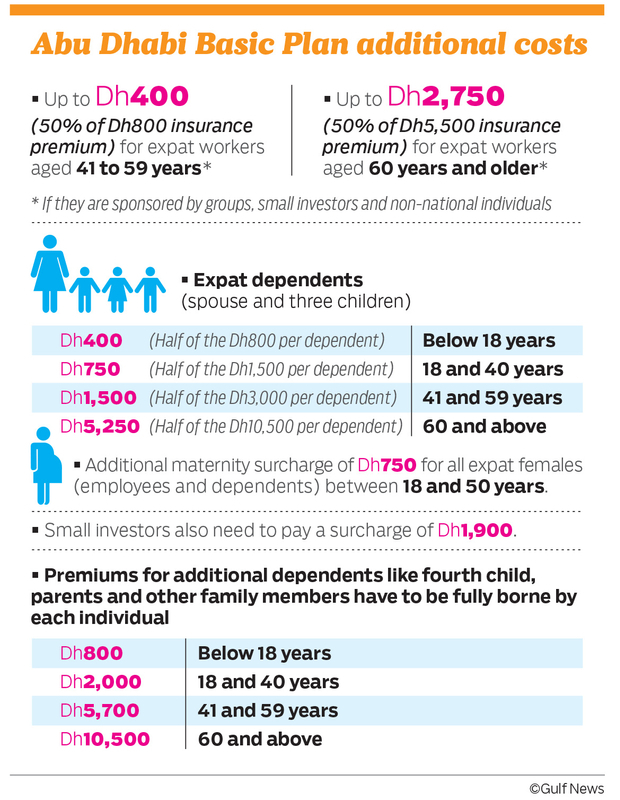 Expat employees under the basic plan also now have to pay half the insurance premiums for dependants, including wife and three children aged up to 18 years. The premiums for dependents are now Dh800 for those under 18 years, Dh1,500 for those aged 18 to 40 years, and Dh3,000 for those between 41 and 59 years. There is also a mandatory maternity surcharge of Dh750 for every married woman between the age of 18 and 50 years. The changes to the insurance law also require Emiratis in Abu Dhabi to now pay 20 per cent of the cost of private health care in Abu Dhabi, and 50 per cent for treatment outside the emirate if the care is already available in Abu Dhabi.